Remove old skin cells to reveal a beautiful new you. 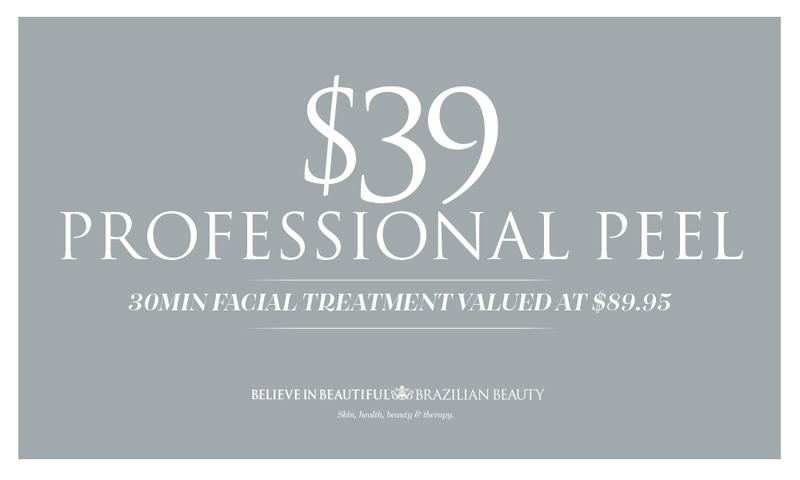 Treat your skin to a little professional refreshment. A refreshed and renewed looking you may be just a peel away. Professional Peels are a fast, effective and non-invasive skin treatment, for immediate cell renewal and a refreshed complexion. We only use Professional Peels developed by The Australian Skin Institute (ASI), formulated with premium ingredients to deliver the best possible results. Your professional Skin Therapist will recommend a specific formulation that will give you the best results and address your particular skin concerns. We offer a range of strengths and formulations to suit your preferences. This Peel will help reduce the appearance of redness, sun damage, acne and fine lines. Glycolic acid assists in the regeneration of collagen and elastin. This is a great starter peel if you have never had skin treatments or used ASI before. The Sensitive Peel is perfect for dark skin types as they are more prone to a skin reaction. This can also be an ongoing peel for clients with sensitive skin. This Peel is ideal if you want to reduce the ageing effect of fine lines and wrinkles. Glycolic Acid exfoliates, regenerating collagen and elastin while reducing the evidence of sun damage, uneven skin tone and fine lines. Gentle Lactic Acid reduces your skin’s sensitivity while effectively reducing sun spots, hyperpigmentation and other skin discolourations. If you are blessed with beautiful young-looking skin this is a great way to keep it. The Youthful Peel is the perfect treatment for preventing premature ageing, fine lines, wrinkles and sun damage. This 25% Glycolic Peel will remove dead skin cells to reveal brighter, evenly textured, supple skin. Glycolic Acid exfoliates while stimulating and regenerating collagen and elastin to slow down the ageing process and keep that fresh renewed look. Glycolic Acid also reduces the appearance of sun damage and fine lines. Renew and restore clarity with this highly effective, pore-cleansing acne treatment. Salicylic Acid delivers an anti-inflammatory and antibacterial action effectively treating excess oil, congestion, blackheads, breakouts and acne.